Given the very tentative recovery in the EU many have been expecting some additional easing. The mere fact that no additional EUR-dilutive policy changes were announced or hinted at during Draghi’s post-rate announcement press conference, and that he sounded a bit more optimistic, and thus less inclined to ease any time soon, was enough to nudge the EUR higher on a minor relief move. That said, the ECB maintains a dovish Bias, and Draghi has stated clearly that the ECB would take further decisive action if needed. He just doesn’t see the need yet. Portugal plans to issue a 10-year bond for the first time since May 2013, hoping to raise money on the financial markets at a relatively low price as its borrowing costs have come down in the wake of rising confidence in the peripheral nations to actually repay their debts. This move began in late 2013 when a formerly bailed out Irish bank was able to sell new bonds, and then the Irish government itself had a successful debt sale in early 2014. Spain soon followed with equally successful sales despite its much worse financial situation. The bond sale will be seen as a crucial test of market confidence in Portugal, which seeks to exit its 78-billion-euro ($106-billion) bailout program this May. In January, Portugal was able to raise 3.25 billion euros in five-year debt at a rate of 4.7 percent — better terms than at a similar operation in January 2013. Sales of the longer maturity 10 year note would reflect greater confidence. 4. German Court Ruling On OMT: Another Quiet Nail In EU’s Coffin? Why is it, that each step the EU takes towards its demise is either underreported or reported as a flawed but positive step in the right direction? In December it devised the single resolution mechanism to backstop failed banks soon to be found during the coming EU bank stress tests. This was hailed as an imperfect but positive step, even though it is too underfunded (ok, really unfunded) and too slow to implement to be of any practical use. Let’s be very clear about this – the popular financial press mostly misread the German Court’s ruling. Reading Reuters here, and similar reports, one gets the impression that the court washed its hands of the whole question and ruled that it did not have the authority. Although it acknowledged that ECB activities were beyond its jurisdiction, the court was quiet clear on how the OMT seemed to violate German law. The German court did not simply say the ruling was out of its jurisdiction and wash its hands of it. In fact it simply referred the case back to the ECJ for “clarifications” about certain points so that maybe, if these points were interpreted very restrictively by the ECJ (unlikely given the ECJ’s record of supporting any and all EU federation), the German Constitutional Court might allow German funding of the OMT and not rule it in violation of German law. However in essence the court said the OMT appears to be in direct conflict with German law by possibly allowing the EU to bypass the German Parliament and requiring Germany to pony up funds for bailouts (the very short version). The court had other objections as well. For example, it did not believe that the OMT was legal based on EU treaties and its understanding of the ECB’s mandate. Bottom line, the German court is likely to be in direct conflict with the ECJ, the highest EU court, and any German funding of OMT at this point is in doubt. We suspect other funding nations also might not be comfortable with allowing the EU to circumvent their own parliaments and hold them legally obligated for untold sums. Thus the ECB’s OMT – its program to be the buyer of last resort of sovereign debt- is not only untested, it’s very likely to be underfunded. Unless of course, as I predicted it must eventually do here, it finally admits it must simply monetize some sovereign debt with newly created/printed money. See here for details on what the court actually ruled, and for links to related posts. The above is an extremely summarized version of everything I read on the German Constitutional Court ruling. This is the fundamental problem that keeps reappearing every time that EU member states are required to make the necessary sacrifices in sovereignty or funds, they just can’t bring themselves to do it. Every funding plan is too little, too late, and contains enough vague wording and procedural hurdles to allow everyone to feel they could escape any obligation that’s too onerous or politically unpopular. Every plan to centralize authority gets watered down so that the real power remains with committees of individual states. The current version of the Single Resolution Mechanism (SRM) is a classic example of this deep ambivalence expressed in legislation. The SRM is the EU’s grand attempt to unify banking supervision and provide a Fed-like backstop to bailout failed banks and prevent contagion risk. 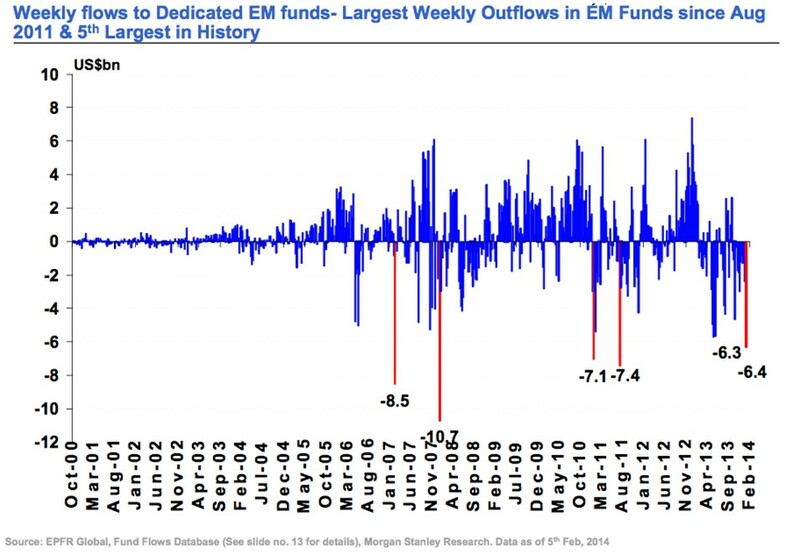 Emerging market funds had their 15th consecutive week of outflows, $6.36 billion, according to Morgan Stanley. That’s the largest exit since August 2011, the fifth largest ever, and when combined with last week’s $6.33 billion figure, we’ve the largest two-week outflow since January 2008. Local issues like labor unrest in South Africa, political unrest in Thailand and currency stress in Turkey. Here’ a chart from Morgan Stanley comparing weekly fund outflows over the past 14 years. 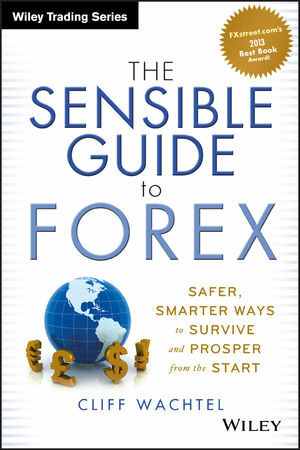 Both US monetary tightening and China’s slowdown (as it transitions to more consumer based, less credit and capital investment based economy), are longer term trends, so to the extent that these two big external factors are the true cause of the EM’s woes, the EM currency and economic decline is far from over. As developed world rates rise, that is likely to continue to drain funds from the EMs. As yet there is no clear consensus about the extent of contagion risk, of EM woes hurting developed world economies. 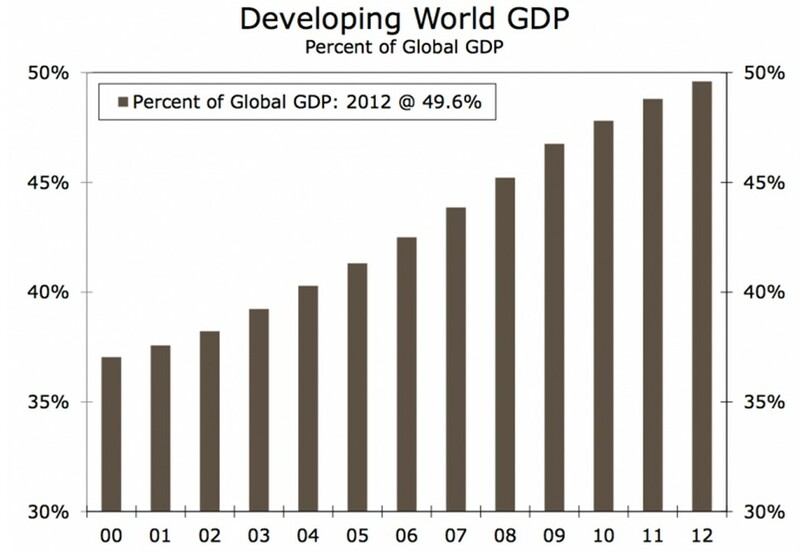 First, the developing world’s share of global GDP has climbed from 37% in 2000 to 50% in 2012. It buys and sells more, so the more it slows down, the more sales in the developed world are affected. Remember, EM growth has been the hoped for replacement for declining growth in the developed world, as demographics and economic stagnation weigh down growth in Europe, Japan, and to a lesser degree, the US. 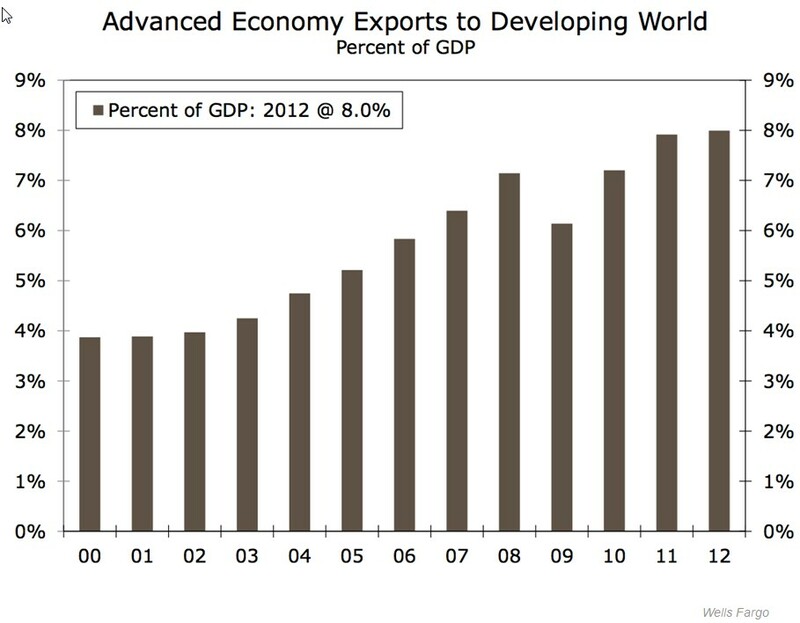 Second, developed economy exports to EM economies have risen from 20% in 2000 to 35% in 2012. As the developed worlds’ EM customers have less to spend that means slower revenue and profit growth for their developed world suppliers. First, to get you into context, we begin with start with a quick look at the weekly trends in our sample of leading stock indexes from Asia, Europe, and the US. The key take-away from the sample of leading global stock indexes shown below, which we use as global risk barometers for reasons covered here, is that the breakdown in the over 18 month up trend on the weekly charts halted this past week, but it did not reverse. We have calm, a temporary bottoming, but neither a rebound nor a sustained downtrend that goes beyond the bounds of a normal bull market correction. In sum, most of our sample weekly charts of leading indexes from around the world remain in clear 18 month old uptrends, albeit weakened ones. Most remain within the middle, neutral zone of their double Bollinger bands, suggesting the odds favor a period of horizontal range trading. For full details on the technical picture, see Global Markets Weekly 2 Minute Drill: Daily Recap & Market Movers. 1) interest rates are down, 2) hedge funds have already de-risked, 3) Q4 earnings have been stronger than expected, 4) individual investors are close to capitulation according to AAII data, 5) gas prices are down, and 6) high yield bonds — a leading market indicator — are outperforming. Ed Yardeni notes that commodity prices have held steady overall, and that his measures of these are sensitive to global economic activity. The implication is that for now there’s no sign that the EM crisis is spreading, nor that there is any notable global slowdown. We’ll keep it short and avoid the whole valuation debate for now. Continued QE, China slowdown, EM slowdown, and EU stagnation are all real headwinds for stocks, which remain near all-time or multi-year highs despite the recent pullback.